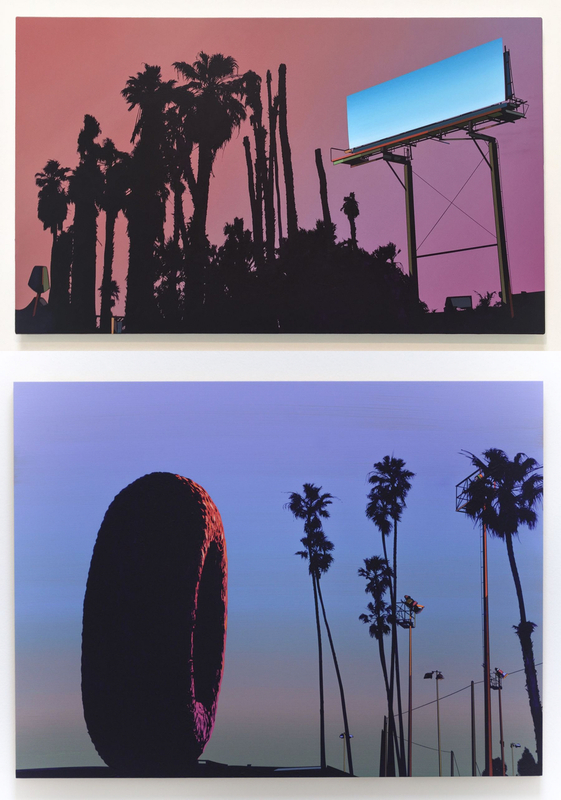 A solo exhibition of paintings by Glen Rubsamen at Christopher Grimes Gallery, with its focus on iconic, exotic images of Los Angeles, made me think about how I fell in love with this city many years ago. Because of its unique look, I like to call LA a giraffe of a city. It looks like no other beautiful animal in the world. And, that's exactly what Glen Rubsamen emphasizes in his paintings, which are based on LA city images he finds with the help of Google Maps. The next step for the artist is to drive to the location to photograph it. 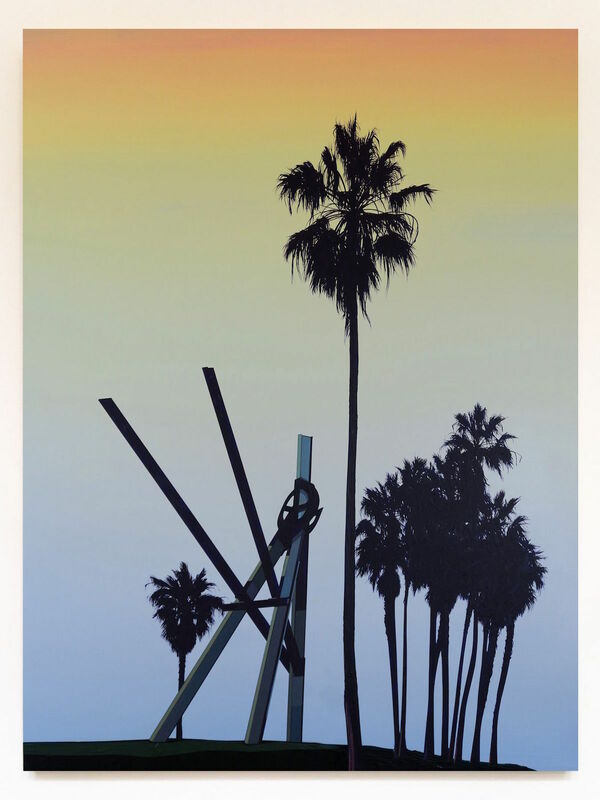 Blissfully avoiding such cliché landmarks as the Hollywood Sign, or the Grauman Chinese Theatre, he makes us wonder at the dramatic juxtaposition of palm trees and the steel beams of the Mark DiSuvero sculpture on Venice Beach. And, the twilight landscape "Pioneer Species," with a gigantic, blank billboard unmistakably brings to mind a huge movie screen, onto which each of us is welcome to project our favorite movie. Rubsamen's tongue-in-cheek painting of a gigantic donut sculpture on the roof of Randy's Donuts has nothing to do with donuts. It appears to be a gigantic tire – the perfect tribute to Los Angeles, the city of cars. Glen Rubsamen was born and raised in Los Angeles, but for almost three decades, has lived in New York and abroad. 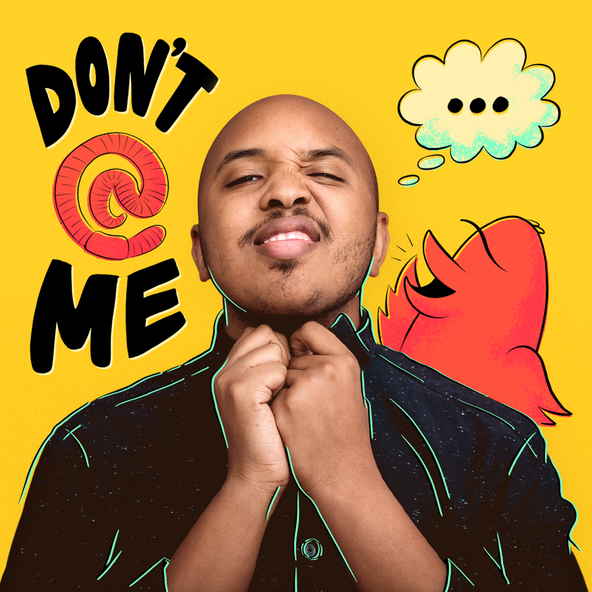 A few years ago, he returned to LA, but still retains a fresh and sharp outsider perspective on our City of Angels. 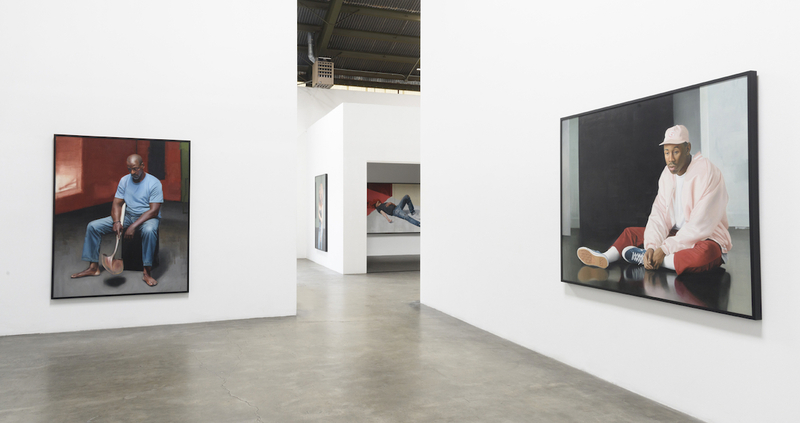 Installation view of "Delfin Finley: Some Things Never Change"
Lora Schlesinger Gallery presents the first solo exhibition of figurative painter Delfin Finley, with its focus on portraits of people of color, including his self-portraits, and a particularly pensive painting of his father holding a shovel. I was taken by the diversity of compositions in his larger scale works, with people sitting, slumped, or laying down. 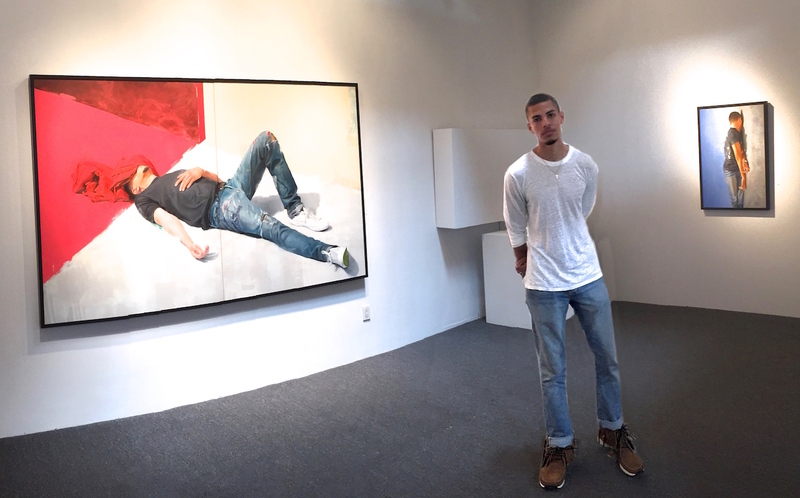 Though Delfin Finley is only 23 years old, and still pursuing his Fine Art degree at Art Center College of Design in Pasadena, his technical skill is something of a wonder. Any figurative painter will tell you that human hands are the most difficult part of the body to paint correctly. Finley seems to do this well, without breaking a sweat. There are certain things that artists must work hard to learn, but there are other things that can never be defined or explained. As the famous saying goes, "talent is like money -- either you have it, or you don't." And, Delfin Finley certainly has it. Installation view of "Chagall: Fantasies for the Stage"
These two exhibitions that I encourage you to see make me think about the two sides of a coin -- one slightly surreal, the other, more realistic. With that, I want to talk about the exhibition presenting the third side of the coin -- the new LACMA exhibition, Chagall: Fantasies for the Stage. Who would think it was possible for a museum to recreate the sensation of being in a theater, while watching ballet or opera productions? There are four stages built for the exhibition, with Chagall set designs projected upon them. Each stage is occupied by what looks like live figures, wearing Chagall costumes -- all of these characters, you could swear, are ready to sing or dance. 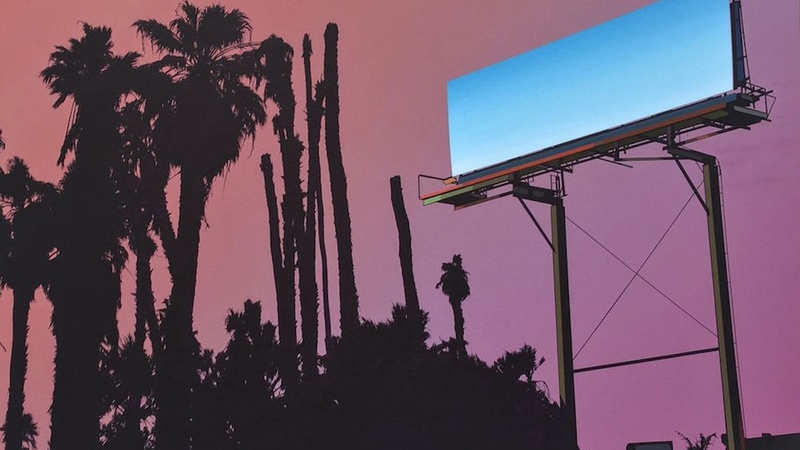 The exhibition is organized by Stephanie Barron, LACMA's Senior Curator of Modern Art, who collaborated with the Montreal Museum of Fine Art to bring this exhibition to LA. Like the recent LACMA blockbuster Picasso & Rivera, which I went to see five times, this new Chagall exhibition begs for repeat visits.